GeekVape Eagle Replacement HBC series are designed for Eagle atomizer. Get them as spare parts. GeekVape Eagle Replacement HBC are spare parts for your GeekVape Eagle. HBC-D07 is dual juggernaut KA1 coil with 0.2ohm resistance, which supports 40-70W wattage. HBC-D06 is dual flat clapton KA1 handbuild coil with 0.15ohm resistance, which supports 40-70W wattage. HBC-S13 is single caterpillar track KA1 handbuild coil with 0.4ohm resistance, which supports 40-70W wattage. HBC-S10 is single flat clapton KA1 handbuild coil with 0.3ohm resistance, which supports 40-70W wattage. HBC-S04 is single clapton SS316 handbuild coil with 0.25ohm resistance, which supports 40-70W wattage. HBC-S08 is a single clapton KA1 handbuild coil with 0.4ohm resistance, which supports 40-70W wattage. 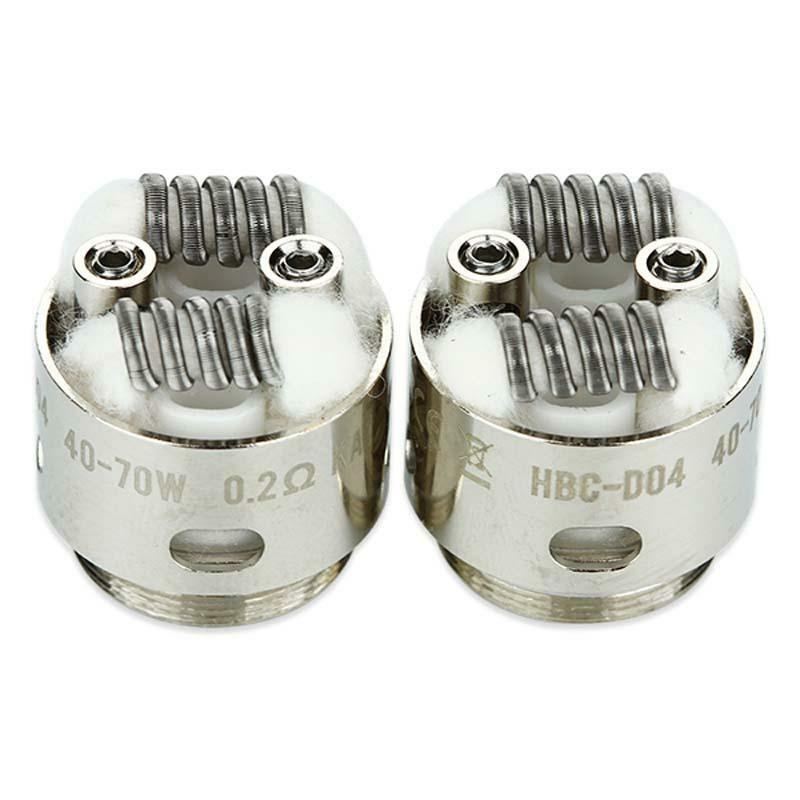 HBC-D05 is dual KA1 tiger coil with 0.15ohm resistance, which can support 40-70W wattage. HBC-D02 is a dual standard SS316L handbuild coil with 0.2ohm resistance, which supports 40-70W wattage. HBC-D03 is dual clapton KA1 handbuild coil with 0.2ohm resistance, which supports 40-70W wattage. HBC-S09 is single fused clapton KA1 handbuild coil with 0.3ohm resistance, which supports 40-70W wattage. HBC-S06 is single flat clapton SS316 handbuild coil with 0.15ohm resistance, which supports 40-70W wattage. HBC-S07 is a single SS316 tiger coil with 0.2ohm resistance, which supports 40-70W wattage. HBC-S12 is single SS316L Notch coil with 0.2ohm resistance, which supports 40-70W wattage. HBC-D01 is a dual standard KA1 handbuild coil with 0.5ohm resistance, which supports 40-70W wattage. HBC - S02 is a single KA1/N80 staggered fused clapton with 0.4ohm resistance, which supports 40-70W wattage. HBC - S05 is a single SS316 fused clapton with 0.15ohm resistance, which supports 40-70W wattage. HBC-S03 is single SS316L staggered fused clapton handbuild coil with 0.2ohm resistance, which supports 40-70W wattage. HBC - S11 is single KA1 taiger coil handbuild coil with 0.3ohm resistance, which supports 40-70W wattage. HBC-D04 is a dual KA1 fused clapton coil with 0.2ohm resistance, which can support 40-70W wattage. • It's for GeekVape Eagle Tank. GeekVape Eagle Replacement HBC Coil GeekVape Eagle Replacement HBC are spare parts for your GeekVape Eagle. 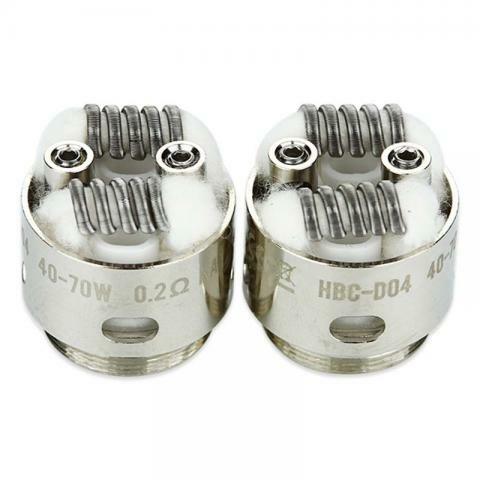 HBC-D07 is dual juggernaut KA1 coil with 0.2ohm resistance. Featuring a Handbuilt Coil (HBC) structure, rewickable system, up to 6.2mL juice reservoir, and dual airflow capability. Very fast shipping, thank you for taking my small order of replacement coils seriously. Really like the Eagle, my everyday adomizer, could easy to change with right tools. Thank you Element Vape for continuing to carry these replacements.